This hack is a pure mockup of players. It was (unitentionally, I guess) made to make people anrgy. It's a really bad example of challenge hack. No one should make hacks like this. 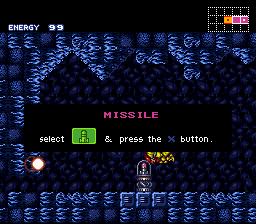 You can get 5 Missiles and Morphing Ball almost from the start and get your way to Kraid. Sounds not bad for now, right? 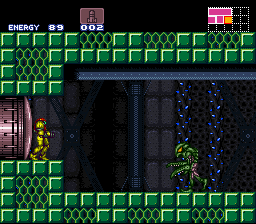 Well, you can stuck in 2 places in the way to Kraid. Now for the battle. His HP is unchanged, so you just can hit him 10 times with Missile. And that's incredibly hard. What's the difficult, you're asking? You don't have High Jump Boots, so you must Wall Jump. A lot. A LOT. A LOT!!! You should do so to land on platforms and... these platforms are made of crumble blocks which are also graphically glitched. So you can hit Kraid only when he's going to the left enough, walljump, shoot him to make his mouth open, fall down, wall jump again, fire Missile and just hope that you won't miss. Oh, and I forgot. During this sequence you may be hit by SUDDENLY respawning claw in the top screen. So you must not only walljump, but also think of "don't get hit by claw". Author spent about hour or so to make the whole hack, I guess. But he could spent another hour to find the position of that damn claw and change the single bit to move it a bit and make everyone happy more or less. Of course, you'll miss a lot of times and fall on spikes a lot, so you'll have to restore the ammo shooting claws and... another surpise. When you need Missile so much, you'll get energy. When you're sufferring from low health and shooting claws in hope to get energy ball just to survive, you often get... NOTHING. When you have enough health and ammo, Kraid is far from you. When Kraid is near to shoot him, you don't have Missiles or having not so much energy to risk. And such things are happening over and over until you finally beat him, lose your life of break your controller (if you even dare to play this). The choice is yours. The more or less efficient technique that I just discovered is to shoot his belly when he's near, THEN starting walljumping in hope that there are no claws flying above you and shooting to his mouth. Exit is in the Varia Suit room. Any hack author that completes a hack KNOWING that there are perma-stucks in it (and does nothing to fix it/is content with them) is one who clearly didn't try very hard to make it (Unless it's a contest hack).